I’m an avid golfer; I play whenever I get the chance. I’ve played on some of the best courses in the world. And I put the course at Finca Cortesin, Spain, in my list of top courses. And, I’d put the opportunity to own a luxury apartment perched above a winding fairway here at the top of my list of finds in all of Spain. From the second I arrived at Finca Cortesin—35 minutes’ drive from the high-end tourist destination of Marbella—I was charmed. I had come because of a hidden opportunity—the chance to own a luxury property in a high-class golf community at ordinary pricing. I had to see this to be certain of its value. These apartments are like nothing else I’ve seen in Spain—set in an oasis of luxury, right on the Path of Progress rolling west from Marbella toward the Rock of Gibraltar. They’re away from the crowded “pack ‘em in” budget holiday destinations. This is the ultimate in luxury buys: Golfers come from all over Europe to play at Finca Cortesin, and they’re willing to pay handsomely for the chance to stay by the course. Our opportunity here has everything I look for: undervalued luxury real estate with massive capital appreciation potential, a strong rental market and a location that’s on the up. I didn’t find this opportunity by chance. In fact, it was only by repeatedly having boots on the ground in Spain and pounding the pavements that I uncovered this deal. It’s been more than worth it. Less than an hour from Malaga’s international airport, Finca Cortesin is right in the heart of the Costa del Sol’s “golden zone”—it’s one of those rare, memorable places that knows how to provide a luxury experience in a quiet, unobtrusive way. Unlike other high-market destinations, like Puerto Banus close by, this isn’t a hangout for flash, champagne-spraying, brash-moneyed types. First impressions count for a lot when it comes to golf on the Costa del Sol—as does reputation. The sport is so ubiquitous that this region in southern Spain has earned another moniker: “The Costa del Golf.” It’s Europe’s most popular golfing destination. That popularity could spell profit—as could Finca Cortesin’s luxury reputation. Spain is in serious bounce-back mode and the window of opportunity in Spain is fast closing. Now, a Path of Progress is rolling down the coastline, west from Puerto Banus—30 minutes’ drive from Finca Cortesin. The opportunity at Finca Cortesin is right on the Path of Progress. And the potential for rental income is strong. When I walked into Finca Cortesin’s clubhouse in early March, it was already busy. Peak season on this southern Spanish coast for holidaying beach-goers is June to September. But at Finca Cortesin the golf rental market adds an extra shoulder season. Unlike the beach holiday crowd, golfers are more than happy to come in March when the sunshine is warm but it’s not quite yet beach weather. Golfers are also willing to pay a premium to stay near a good course. Many travel in groups…so are happy to split the cost of a place between a friend or two. To stay near a course like the one at Finca Cortesin, most won’t blink at a premium price. When I searched options to stay here I could only find Finca Cortesin’s hotel at €800 ($1,164) per night. Because the rental market at the apartments is completely undeveloped, you could be making money renting your luxury apartment for that much per week. The developer behind these apartments had big plans for his project. He built during the peak—and expected to make north of €500,000 ($728,268) for his sea-view apartments. Some sold. Then, the crisis hit. Completed Altos apartments were just left sitting there. There hasn’t been a big enough push to sell them. To find a deal at Altos de Cortesin, buyers have had to seek it out. These apartments are spacious, especially for European apartments—139 square metres, including a terrace. They have views of the Mediterranean Sea. The finishes are high-end: They have full Italian marble floors, nice kitchens, an abundance of space and an outside terrace for entertaining. Beyond the pretty garden outside is a private-feeling communal pool shared by only a few owners. The community at Altos de Cortesin is low-density and feels boutique. Beyond the pool, there are views to the Mediterranean Sea. 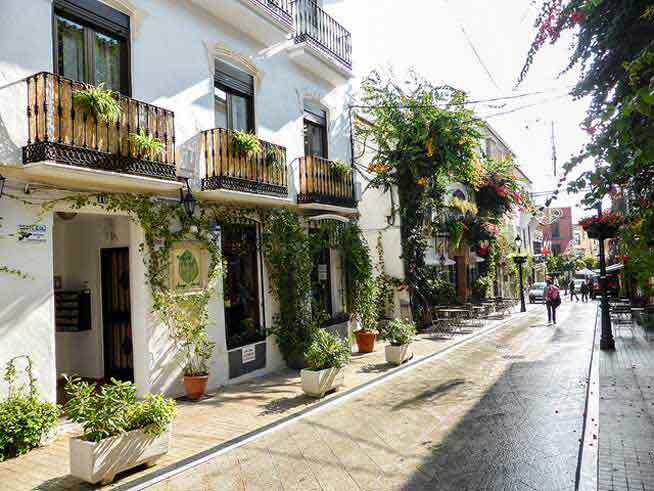 Unlike other apartments in this price bracket on the Costa del Sol, they’re not just a place to sleep at night. They’re the sort of place where you’d stay in and cook—and invite friends over for dinner and Spanish wine.